'The trust vote would have been closer had the DMK not been expelled,' O Panneerselvam tells A Ganesh Nadar at the launch of an e-learning portal in Jayalalithaa's name. Former Tamil Nadu chief minister O Paneerselvam’s house in Chennai is normally crowded with members of the public, party cadres, former ministers, former and current legislators and also hangers-on. And it is not because every afternoon everyone present is served a hearty lunch, or that tea and snacks are served at regular intervals. On Wednesday there was extra crowds gathered there as he launched a portal which will be a "hub of e-learning, interaction, opportunity, and connection." The website ammakalviyagam.in, named after late chief minister Jayalalithaa, was launched by Panneerselvam as part of her 69th birth anniversary celebrations in the presence of many students who spoke glowingly of the effort. However, the website itself was available for only around 15 minutes after which it crashed, with the organisers blaming it on the “server overload”. Jayalalithaa is fondly addressed as "Amma" (Mother) by her supporters. ‘Amma Kalviyagam is a hub of learning, interaction, opportunity, and connection. It is a platform for learners, experts, academic and industry professionals, and recruiters to meet, gain and provide skills, and discover and hone talent,’ a release from the Panneerselvam camp said. The portal, which will help students with assistance from reputed teachers free of cost in the convenience of their homes, was an initiative in line with Jayalalithaa's Vision TN 2023, where she had set goals for development in various sectors including education, it said. Launching the initiative, Panneerselvam said it was Jayalalithaa's desire that "youth of the state should never be deprived of education and should have the best possible resources to empower them with the best of knowledge" and pointed to her popular free laptop for students scheme. "With the launch of this new initiative we have taken the first step towards fulfilling Amma's dreams to empower the youth of Tamil Nadu," he said. The initiative was based on the Massive Open Online Courses (MOOC) model. “In the last five years of Amma’s rule, 51 institutions of learning were started in the state. This includes schools, colleges, medical and engineering colleges, ITI and polytechnics,” OPS, as he is known, said on the occasion. “The Tamil Nadu state syllabus for 10th and 12th comes nowhere near the knowledge required to clear the JEE and enter IITs. This website will bridge that gap. We will train children online to appear for this exam and other professional exams. The website will also provide vocational training and jobs. “The best professors in the business will coach the poorest of the poor through this website. It will be online training and so the student does not have to go anywhere. We have already given them laptops. “Private training classes are charging Rs 2 lakhs to train students to clear the JEE. Our website will provide the same training free. It will also help students appearing for the 10th and 12th public exams. After the launch of the website, OPS spoke to Rediff.com briefly. 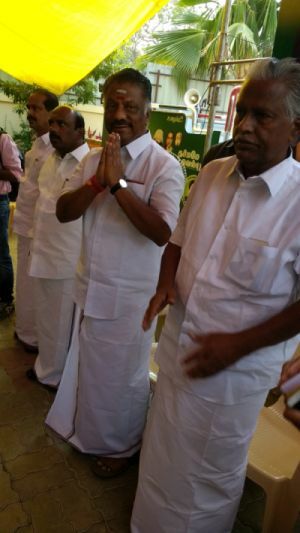 If the Dravida Munnetra Kazhagam MLAs had not been expelled from the assembly during the trust vote by E K Palaniswami on February 18 do you think the AIADMK legislators would have voted as per their conscience? The vote would have been much closer if the DMK had stayed in the house. Once they left it became lopsided, but what to do? Such is life! We were told that the MLAs were in touch with you and about 15 to 20 would cross over in the Assembly that day. What happened? Even while they were coming to the assembly in buses and ministers’ cars they were in touch with us. They said they would vote with us but that did not happen. Wonder what made them change their minds after they reached. Will you have another chance at topping the government when the budget comes up for voting in the assembly? Yes, we will have another chance. Let us see what happens that day. The righteous should win. We will wait and see (smiles). Image: O Panneerselvam at the launch of the e-learning portal. Photograph: A Ganesh Nadar/Rediff.com. Can the niece claim Amma's legacy?